So the lovely Kel over at Natsukashii, one of my fav blogs to read, has awarded myself (thank you, thank you!!!) 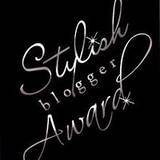 and several other stylish bloggers the Stylish Blogger Award. Hmmm, so seven things about me...how about my 7 guilty pleasures? 1. I love McLeod's Daughters. My Mum got me the first season for Christmas which I have been working my way through, and I have the last season recorded on Foxtel (which I haven't seen, because I had lost interest by then!). 4. I love to get a McDonald's Chocolate Sundae with a large fries, and then I eat the fries dipped in the Sundae. Delicious! 7. I read Harry Potter whenever I'm feeling a little down or flat, it always cheers me up coz it feels like I'm hanging out with old friends. Thanks. I will be passing this on hopefully very soon!